Two years after a heart attack left him too exhausted to even tend his garden, Miroslav Dlacic is now able to walk again without becoming worn out. An international team of Mayo Clinic doctors and researchers, led by André Terzic, M.D., Ph.D., director of Mayo Clinic’s Center for Regenerative Medicine, helped Dlacic reclaim his life by discovering a way to regenerate heart tissue through stem-cell therapy. For decades, treating cardiac patients has typically involved managing heart damage with medication. It’s a bit like driving a car without fixing a sluggish engine; you manage the consequences as best you can and learn to live with them. But in collaboration with European colleagues, Mayo Clinic researchers have discovered a revolutionary means of repairing a damaged heart—of actually fixing the machine. 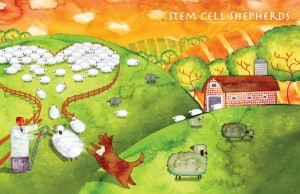 In this breakthrough process, stem cells are harvested from a cardiac patient’s bone marrow. They undergo a laboratory treatment that guides them to become cardiac cells. The treated cells are then injected into the patient’s heart in an effort to grow healthy heart tissue. The study is the first successful demonstration in human beings of the feasibility and safety of transforming adult stem cells into cardiac cells. “We guide the stem cells to become something useful, in this case, cardioprogenitors,” Dr. Terzic explains. This discovery has implications for millions of people. Cardiovascular disease is the leading cause of death worldwide. In the U.S. alone, about 5.8 million people have heart failure, and the number is growing. Beyond heart failure, the Mayo research also is a milestone in the emerging field of regenerative medicine, which seeks to go beyond palliative treatments to fully heal damaged tissue and organs. Mayo Clinic is uniquely positioned to pursue this complex therapy. In addition to its global reach, Mayo Clinic has its Center for Regenerative Medicine at the forefront of efforts to develop reparative solutions for a range of conditions. To read the full story about Dr. Terzic's research into regenerative medicine, visit Discovery's Edge, Mayo Clinic's research magazine, at http://www.mayo.edu/research/discoverys-edge/regenerating-heart-tissue-stem-cell-therapy.